This article is about the movie director. For the cryptologist by the same name, see Bimal Kumar Roy. 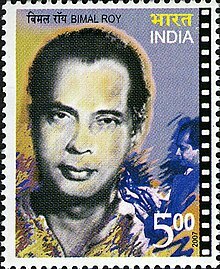 Bimal Roy (Bengali: বিমল রায়; 12 July 1909 – 8 January 1966) was a Bengali Indian film director. He is particularly noted for his realistic and socialistic films such as Do Bigha Zamin, Parineeta, Biraj Bahu, Madhumati, Sujata, Parakh and Bandini, making him an important director of Hindi cinema. Inspired by Italian neo-realistic cinema, he made Do Bigha Zamin after watching Vittorio De Sica's Bicycle Thieves (1948). His work is particularly known for his mise en scène which he employed to portray realism. He won a number of awards throughout his career, including eleven Filmfare Awards, two National Film Awards, and the International Prize of the Cannes Film Festival. Madhumati won 9 Filmfare Awards in 1958, a record held for 37 years. Bimal Roy was born on 12 July 1909, to a Bengali Baidya zamindar family in Suapur, Dhaka, which was then part of the Eastern Bengal and Assam province of British India and is now part of Bangladesh.And he produced lost movie in Bengali language & Hindi also. Bimal Roy moved to Calcutta and entered the field of cinema as a camera assistant with New Theatres Pvt. Ltd.. During this time, he assisted director P.C. Barua as Publicity Photographer, on the hit 1935 film Devdas, starring K.L. Saigal. In the 1940s and 1950s Roy was part of the parallel cinema movement in post-war India. He collaborated on Anjangarh (1948), one of the last major films of the New Theatres, however, the Kolkata-based film industry was now on the decline, thus Roy shifted his base to Bombay (now Mumbai), along with his team in 1950, which included Hrishikesh Mukherjee (editor), Nabendu Ghosh (screenwriter), Asit Sen (assistant director), Kamal Bose (cinematographer) and later, Salil Chaudhury (music director), and by 1952 he had restarted the second phase of his career with Maa (1952), for Bombay Talkies. He was famous for his romantic-realist melodramas that took on important social issues while still being entertaining. He was a filmmaker of great and in-depth understanding of human strengths and weaknesses. In 1959, he was a member of the jury at the 1st Moscow International Film Festival. He died of cancer on 8 January 1966 at the age of 56. He was survived by four children, daughters Rinki Bhattacharya, Yashodhara Roy and Aparajita Sinha, and his only son, Joy Roy. His eldest daughter, Rinki Bhattacharya, married the director Basu Bhattacharya against the wishes of both their families. The marriage collapsed within a few years, but resulted in the birth of a son, the actor and screenplay writer Aditya Bhattacharya. Rinki Bhattacharya now heads the Bimal Roy Memorial Committee. Bimal Roy has received several awards. Bimal Roy's influence was far-reaching, both in Indian cinema and world cinema. In Indian cinema, his influence extended to both mainstream commercial Hindi cinema and the emerging Parallel Cinema. His film Do Bigha Zamin (1953) was the first film to successfully straddle art and commercial cinema. It was a commercial and critical success, winning the International Prize at the 1954 Cannes Film Festival. As a result, the film's success paved the way for the Indian New Wave. In commercial cinema, the most influential film he directed was perhaps[according to whom?] Madhumati (1958), his first and only collaboration with Ritwik Ghatak (who wrote the screenplay), and one of the earliest films to deal with reincarnation. It is believed[by whom?] to have been the source of inspiration for many later works dealing with the theme of reincarnation in Indian cinema, Indian television, and perhaps world cinema. It may have been the source of inspiration for the American film The Reincarnation of Peter Proud (1975) and the Hindi film Karz (1980), both of which dealt with reincarnation and have been influential in their respective cultures. Karz in particular was remade several times: as the Kannada film Yuga Purusha (1989), the Tamil film Enakkul Oruvan (1984), and more recently the Bollywood film Karzzzz (2008). Karz may have also inspired the American film Chances Are (1989). The most recent film to be directly inspired by Madhumati is the hit Bollywood film Om Shanti Om (2007), which led to Roy's daughter Rinki Bhattacharya accusing the film of plagiarism and threatening legal action against its producers. Bimal Roy's films continue to be screened at major national and international film festivals in India, Europe and North America. His films are being restored and digitised by the National Film Archive of India (NFAI) at Pune. In July 2014, Prince of Wales Museum, Mumbai hosted an exhibition; Bimal Roy: Life & Times, organised in collaboration with his children. The exhibits included screening of the films; Madhumati, Sujata and Bandini, besides film posters, costumes and memorabilia, including an Arriflex camera used to shoot Devdas and Sujata. The Bimal Roy Memorial Trophy has been awarded every year since 1997, by the Bimal Roy Memorial & Film Society to honor both experienced artists and other contributors from the Indian film industry as well as new and upcoming outstanding young filmmakers. A postage stamp, bearing his face, was released by India Post to honour him on 8 January 2007. 1958 Madhumati Bimal Roy Productions Highest grossing film of 1958. It garnered 9 Filmfare Awards, a record held for 37 years. Rinki Roy Bhattacharya (2009). Bimal Roy: The Man who spoke in pictures. Penguin Books Limited. ISBN 978-81-8475-818-4. Rinki Roy Bhattacharya (2014). Bimal Roy's Madhumati: Untold Stories from Behind the Scenes. Rupa Publications. ISBN 8129129167. ^ a b Anwar Huda (2004). The Art and science of Cinema. Atlantic Publishers & Dist. p. 100. ISBN 81-269-0348-1. ^ a b "Awards for Bimal Roy (I)". Internet Movie Database. Retrieved 30 January 2009. ^ "Memories and melodies of a golden era". The Hindu. 13 April 2001. Retrieved 29 April 2013. ^ a b Reema Gehi (20 June 2014). "First in Mirror: Enter Roy's world". Mumbai Mirror. Retrieved 7 September 2014. ^ "1st National Film Awards" (PDF). Directorate of Film Festivals. Retrieved 21 August 2011. ^ "3rd National Film Awards" (PDF). Directorate of Film Festivals. Archived from the original (PDF) on 5 November 2013. Retrieved 1 September 2011. ^ "6th National Film Awards". International Film Festival of India. Archived from the original on 20 October 2012. Retrieved 3 September 2011. ^ "Festival de Cannes: Two Acres of Land". festival-cannes.com. Archived from the original on 4 February 2012. Retrieved 25 January 2009. ^ Srikanth Srinivasan (4 August 2008). "Do Bigha Zamin: Seeds of the Indian New Wave". Dear Cinema. Archived from the original on 15 January 2010. Retrieved 13 April 2009. ^ Do Bigha Zamin at filmreference. Filmreference.com (3 August 1980). Retrieved on 2018-11-13. ^ Trends and genres. Filmreference.com. Retrieved on 13 November 2018.